Caption: Who would hide their child? 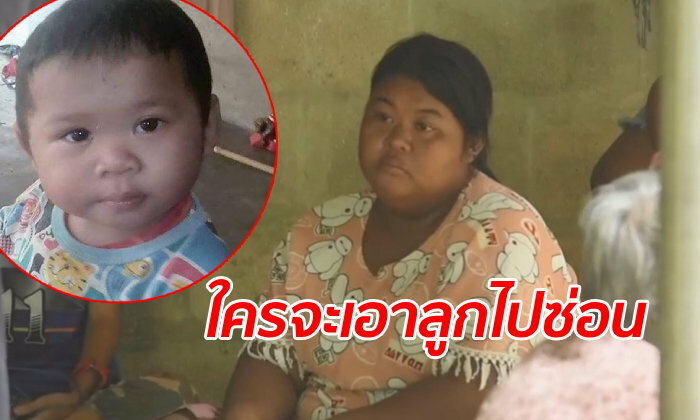 Sanook reported that a child called Phakin or "Nong Big" had been missing from his home in Tha Yang district of Petchaburi since Monday. He is aged just one year and seven months. Press speculation in the case is rampant. Initially there were fears he had fallen into a canal. Another theory is that he has been abducted. But the Thai media have been on the case and are postulating all manner of scenarios. Mother Araya and father Chokechai, who works in Bangkok and had been there since New Year, were interviewed separately by Tha Yang police. They deny being involved in their child's disappearance. Araya told the press: "I haven't hidden him or sold him". She believes he is still alive. Their eight year old eldest son told police that a man in glasses had taken his brother away. A rescue foundation involved in the search said that if the child had fallen in water and been submerged decomposition would have meant he would have floated to the surface by now. Sanook reported there are allegations that the mother was in a desperate mental state and had got rid of her own child to spite her husband. But the couple said they had no marital problems. They have set up a shrine with incense and candles on a termite mound in front of their home in an attempt to appeal to the spirit of the land for the return of their missing boy. should add the pic of mom to the topic "myth of the beautiful thai girl"
They ﻿have set up a shrine with incense and candles on a termite mound in front of their home in an attempt to appeal to the spirit of the land for the return of their missing boy. Or a photo of you with the topic "Idiots never die out!!!"